Example: Render left, Photo right. 3D rendering has become a must-have in the ultra-competitive market of project development – but our perceptions of reality when it comes to project imagery are creating an interesting phenomenon. However, as 3D rendering gets closer to reality, an interesting phenomenon is occurring. When we know an image is fake, we increasingly scrutinise any imperfections – despite these imperfections being the very things that make the image look more realistic. When we know it’s a photograph, we accept all imperfections without question. Outside of its creative merit, the main goal of 3D rendering is to communicate an idea or a project to potential buyers. This is why beautiful and believable images of future developments have proved so successful in attracting potential buyers. Interestingly, in our recent industry survey, 80% of people in the industry said that photorealistic imagery is the most important thing they look for in their visual content (as opposed to any other options, which only got 30-40% of the vote). This shows that industry professionals believe that photorealistic marketing imagery is more persuasive for their audiences. However, when looking at CGI images, we begin to draw on our own memories rather than the reality of what we would see in photos – meaning that ‘photorealistic’ images don’t always have to be exactly photo-real. They just need to have the details that our brains associate with reality. But, the catch is that when you’re looking at an image you know to be fake (CGI), your brain will quickly pick out every aspect of the image that looks ‘fake’ – even if it’s as realistic as a photo. Whereas, if you see the same things in an image you know to be a photo, your brain will automatically accept it as ‘reality’ – even if it’s the exact same image. This technique creates a unique set of challenges (see our discussion of blue vs. white skies) for the artist responsible for re-creating the image. There’s an industry tale in which a team of artists working on the imagery for IKEA brochures were told by their project manager that the carpet looked ‘too 3D’ and needed to be changed. The artists were lost on how to address this, because in their opinion they couldn’t make it any more real. After a day of ‘work’, they decided not to make any changes before re-submitting the design to their manager. The project manager believed the changes had been made and approved the brochure – no questions asked. The ‘new’ image looked more realistic in the managers’ view. However, no aspect of the image had been changed. After being advised that the carpet was ‘fixed’, they had no reason to question its realism, so they actually perceived it as being realistic. This is a prime example of how our brains work to pick out the ‘fake’ details in an image we know to be CGI, and of how easy it is for our brains to manipulate our perception of reality. We were hired to produce some images of a kitchen set for a large Australian hardware store, saving them the cost of physically building, styling and photographing the kitchens. Halfway through the project, we began getting some strange comments about the image. This was before we were sent any images of a kitchen they had built previously. 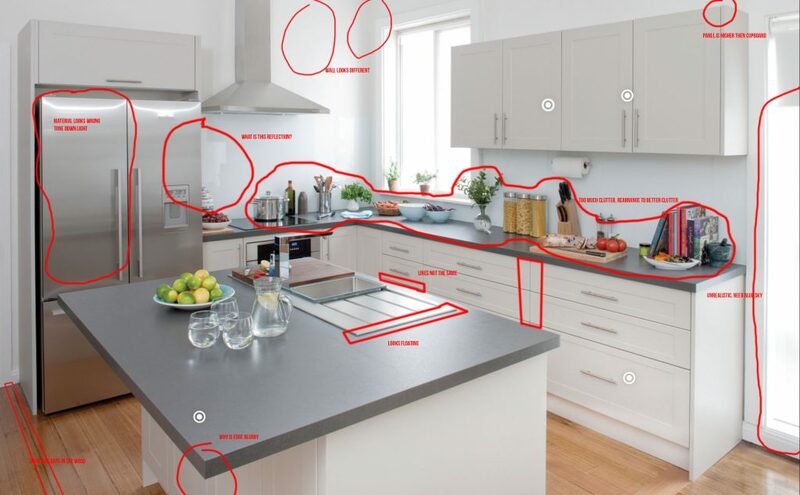 Once we received the photo of the kitchen they built previously, we understood where the issues were coming from. The photos they had of the previous kitchen had been heavily edited – so much so that every small imperfection had been edited out. This type of editing would never work on a 3D render (since the image would look too obviously fake – creating an interesting catch 22 for designers), but they could get away with it in a photo, and expect the same thing to work for a 3D render. The difference between the photo and the 3D render is that they knew the render was computer generated (or ‘fake’), so even with the lifelike imperfections it was always going to appear more unrealistic than the heavily edited photo to their eyes. Despite the fact the render was more true to reality. That’s the power our perception has over reality. If we have been told something is fake, often we look for justification that it is. The challenge 3D artists face in this debate is having to recreate the imperfections of the real world in order to achieve a photorealistic image, whereas clients often want an artistic or idealistic version of a design or project that may not be true to the real thing. Comments made by our internal team that we would typically receive if this was a CGI, but this is a photo. An effective and eye-catching visual can mean the difference between the success and failure of a design, and can enable a project to come to life, which is why it’s easy for project teams to get so caught up in the perfection of each image. While this is an interesting phenomenon, it is something for professionals in the property industry to keep in mind when working with a render company. Be mindful that when you are frustrated that your 3D imagery looks too ‘fake’ that your perception of the CGI could be born out of what you only believe to be true – instead of what the reality is. We recommend that you gain reference images from the real world to help you articulate why you think something looks ‘fake’. Also, see our article on how to give your 3D rendering company good feedback. Below we have included a brief comparison test of some of the leading 3D visualisations and real photography. The question is: can you tell the difference between the images? How does it change your perception of an image or reality?